The Groene Toren (Dutch for Green Tower) is the iconic centerpiece and functional center of Bajes Kwartier. In collaboration with OMA and Lola Landscape Architects, FABRICations developed the transformation masterplan for the Bijlmerbajes, a prison complex to be transformed in the neighborhood of the future: the Bajes Kwartier. 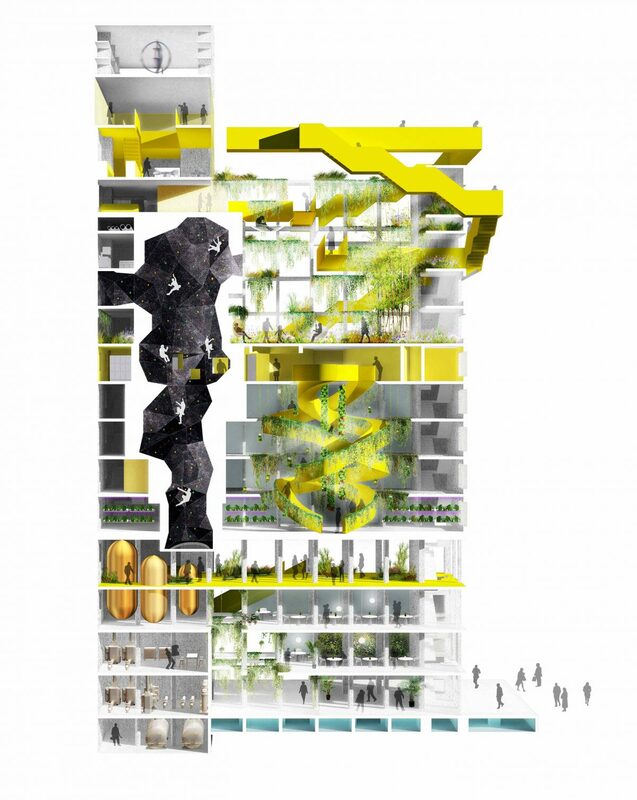 The transformation incorporates a circular approach, by reusing elements and preserving cultural heritage. The new plan is on the forefront of sustainable innovations regarding energy production, waste processing and healthy living principles. All these systems come together in the Green Tower. 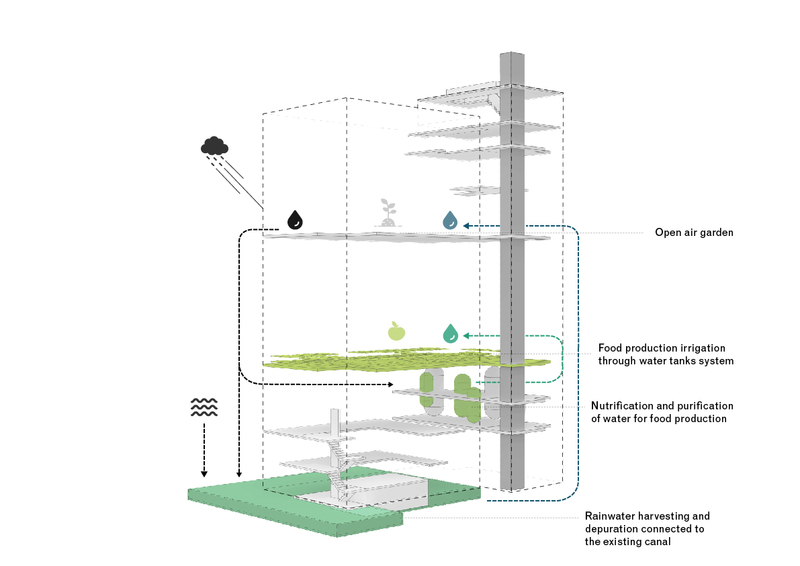 FABRICations designed the beating heart of the neighborhood to incorporate a vertical park, new ways of sustainable energy production, organic food production, organic waste processing and rainwater collection. 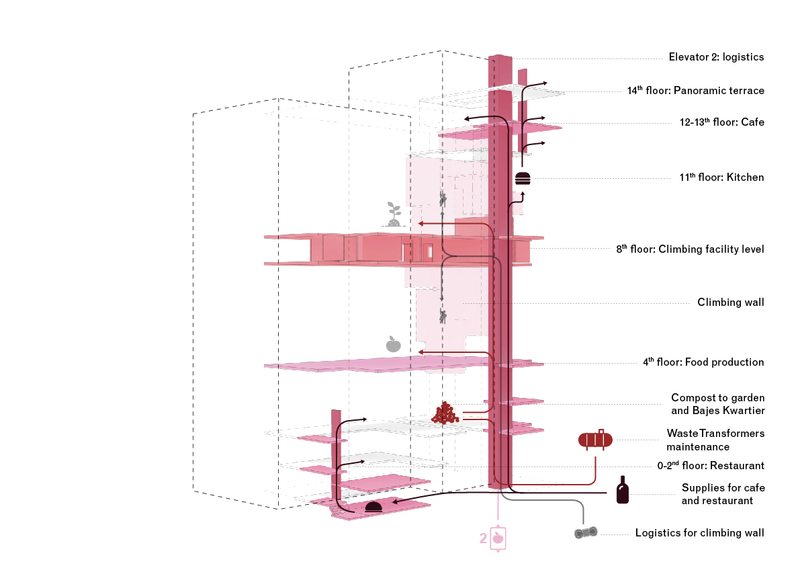 The tower, which used to host female inmates, is transformed to materializes circularity, accessibility and connectivity into an innovative architectural system. Moreover, all of this can be experienced first-hand by visitors of the Green Tower. 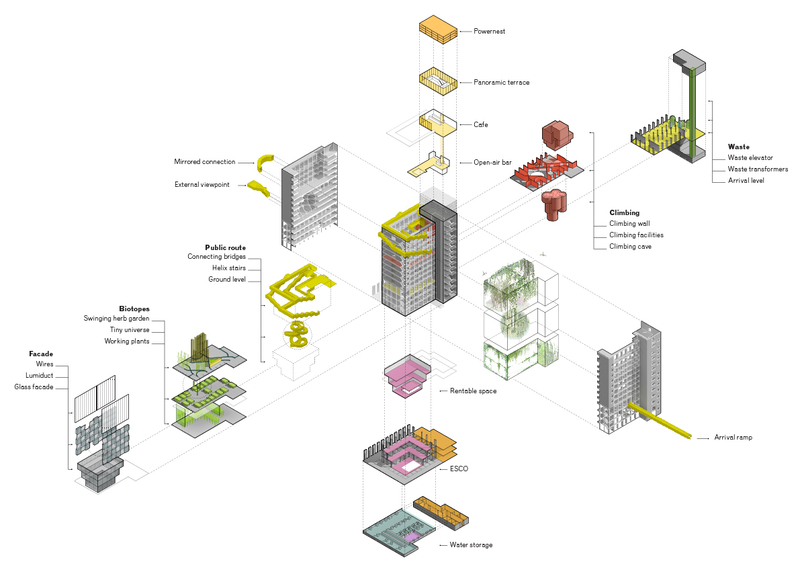 The design of the new Green Tower builds upon the original organizational principle of the tower: three blocks separated by two supporting levels. Each block has its own set of architectural interventions. The architectural interventions mostly consider the implementation of natural green (i.e. gardens, green facades) and technical green (i.e. sustainability-oriented technology and infrastructure). 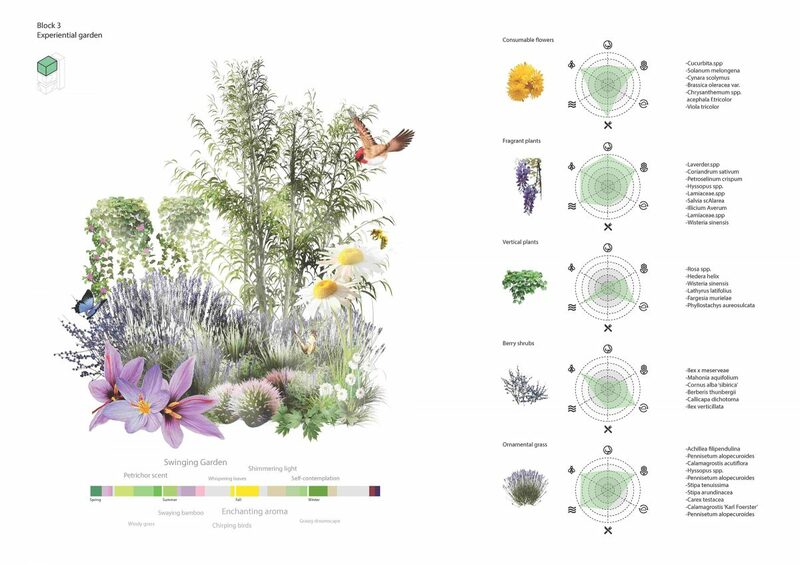 As a result of the organizational principle, each block has its own climate, biotope and technical function. A striking yellow staircase connects the blocks and acts as a continuous spatial sequence to guide visitors through the building. 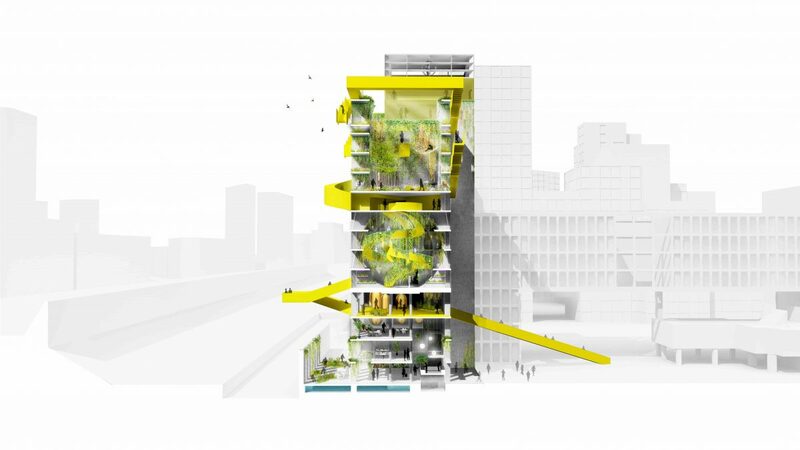 The yellow stairs start with a ramp which brings the visitors from the public square outside to the entrance level of the Green Tower, and leads the visitors all the way up to the panoramic cafe on the top floor, where food produced in the Green Tower can be consumed. Along the yellow path, visitors can experience public program and resting areas, in direct visual relation with the technical equipment that supports the sustainability processes of the building. 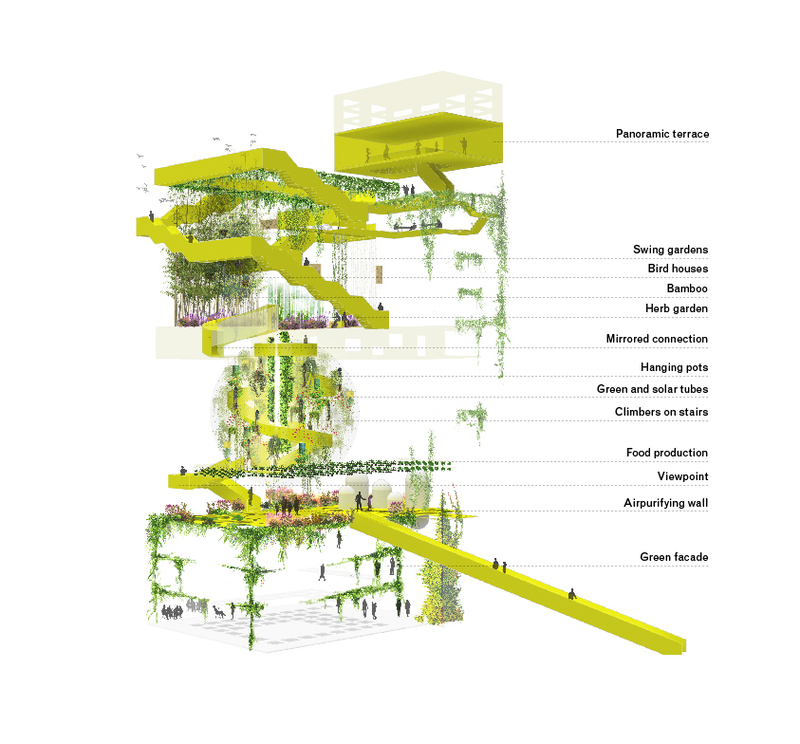 Diagrammatic representation of the yellow public path in relation to the different biotypes of vegetation around the building. Rainwater (Up-left) is harvested and collected in the building basement, to be reused for food production and other processes around the building. Food (Up-right) is produced on the fourth floor and consumed in the café on the top floor and in the restaurant on the ground floor. 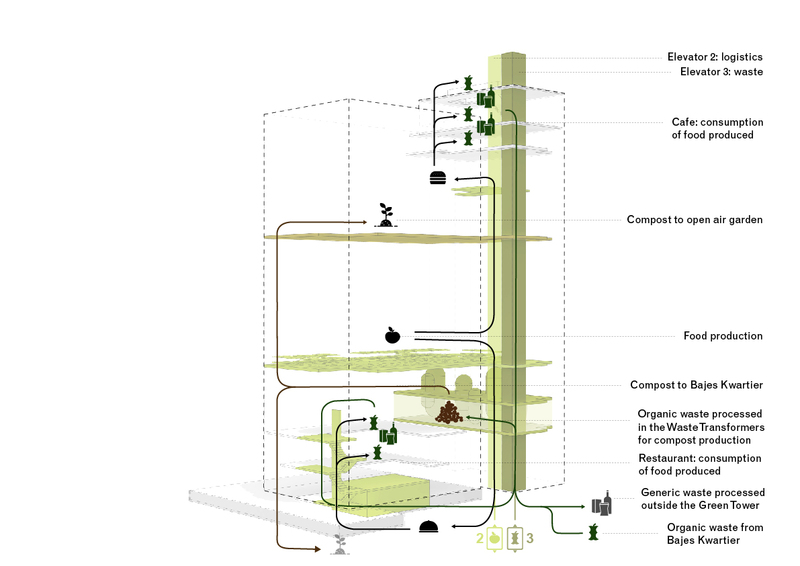 Organic Waste (Bottom-left) is collected from the tower and the surrounding buildings to be transformed in compost, which is used for the vegetation around the building. 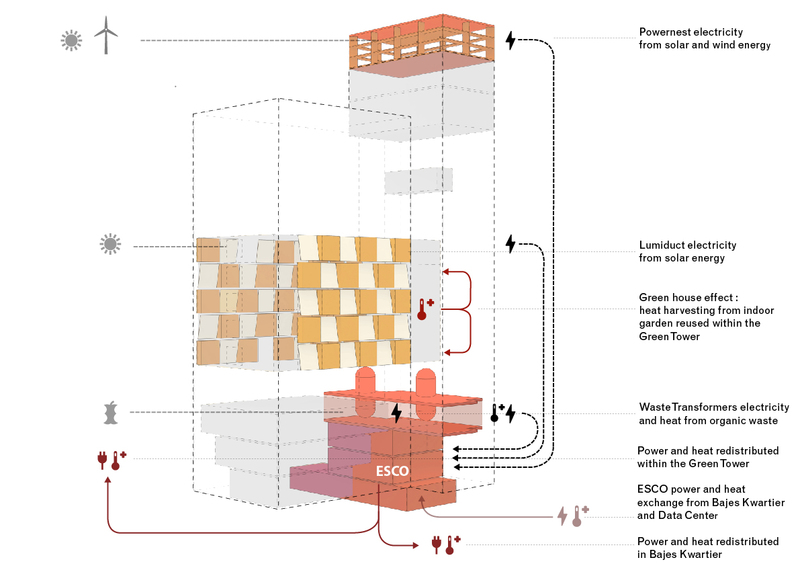 As a result of this process, Energy (Bottom-right) is generated in the waste transformer to be used in the building. Additionally, a Power Nest generates electricity from wind and solar power, to guarantee regular provision of sustainable energy.